69 olds 442 W-30 with a myriad of problems. The owner was quite frustrated as the previous shop had taken his money without resolving the issues. The problems were extensive but once identified and corrected he now says it puts a smile on his face every time he puts a key in it. 52 Chevrolet pickup. A nice truck with some minor left over restoration issues. We have been working with the owner correcting these nuances one at a time as his budget permits. 37 Ford coupe. Another new purchase that had issues. Ineffective brakes, a flakey charging system, electrical gremlins along with other irritations that take the pleasure out of owning a car like this. All corrected now. New GM ZZ-4 Crate motor and Richmond T-10 4 speed getting ready for installation into a customers 69 Camaro. 63 Corvette. A really nice car that became even nicer once the suspension and rear end was rebuilt. 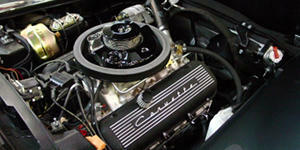 69 Plymouth GTX that had been plagued with drive ability issues for quite some time. Several shops gave up on it. That's not an option at T & M. A good tuning and some electrical issues were at the root cause of all the grief. Turn the key and go now. The owner claims it runs better than it ever has. That's what we strive for. 65 Pontiac GTO with only 34K original miles. Original owner to boot. One rarely gets to see a car this original. It had developed some issues over the years as well as a few that were there since new. All dialed in and tweaked now. Owner says he scared himself on the way home when it broke traction midway through 3rd gear. He says it has never run like it does now. 79 Chevy pickup, pro touring. 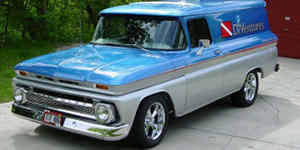 A really nice truck that we did some engine and transmission tweaks to. We later installed A complete Vinatge air a/c system. 77 Chevrolet Monte Carlo. We performed a frame on restoration on this car. 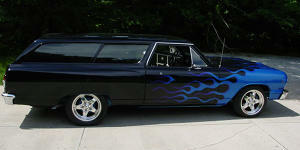 It has taken first place awards at every show it was entered into, including the World of Wheels in St. Louis. A picture of the Monte Carlo's front suspension after restoration. 29 Ford Model A. A fresh restoration from another shop that didn't finish their job. A plugged radiator, blown head gasket and poorly rebuilt brakes is all it took to get this car where it should've have been when it was finished. 68 Dodge Charger with a HEMI. 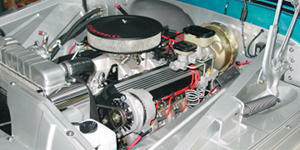 This car underwent a non rotisserie restoration and has been 100% trouble free since finished. 72 Oldsmobile Cutlass. This one was easy. All it needed was a good tune up to make the lady owner happy. Several shops tried and failed to get it right. She says she now refuses to let anyone else work on the car now. 72 Plymouth Cuda. 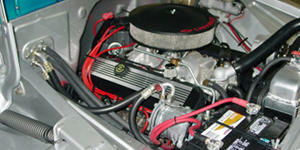 A fresh owner performed restoration that was driving him nuts due to a few issues he had trouble resolving. One was a persistent oil leak that made his driveway look like the Exxon Valdez was docked there. The other more interesting one was a gremlin that would cause the motor to die when the right door was closed. HEH HEH!!! We love a challenge. No problems anymore. We got him squared away and it's been trouble free since. 49 Ford mild custom with a flathead, COOL!!! A new clutch and fresh Brakes with silicone based fluid took care of this one. 69 Chevelle SS396. An impeccable restoration in for it's annual look over. 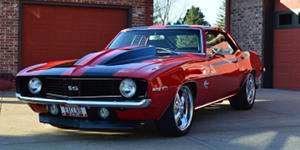 The current owner doesn't know who restored this car but it is definitely one to define the term RESTORATION. 69 Plymouth 440 Six pack Road runner. Nice car that only needed a few small items corrected. 69 Ford Mustang. Another shop had taken advantage of this owner for quite a large sum of money. The rust and mechanical issues were so extensive that it wasn't feasible to keep pouring money into it. We showed him the issues, gave him an honest evaluation and had him tow it home due to the fact it wasn't safe to drive. SAD! 66 Dodge Coronet. Another nice car that we have had the pleasure of working on with the owner. He has tried a few other shops and says he's back to stay, he's done with the B.S. 46 Mercury Flathead V8. The owner started taking this car apart in 1959. He brought it to us when he figured out he was running out of time to finish it. We had it running and driving in less than 2 months. 72 Oldsmobile 442 Convertible. A fresh frame off restoration from another shop that wasn't quite up to par. I guess the term frame off restoration is loosely defined. 38 Ford sedan with a Full house Flathead, Lincoln Zephyr gears and a Halibrand quick change. WOW. Also has Air conditioning and an overheating problem. WHAT?? A flathead with an overheating problem???? Not ANYMORE!!! We got that problem solved as well as a few others. By the way, the A/C still blows snow. Mercury whose motor is pictured to the far left is ready for delivery. The owner was quite excited having last driven the car in 1959. 69 Ford Mustang. 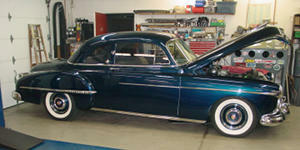 A beautiful owner restored car that had a few issues that were causing his hair to turn gray. A bit of tweaking on the carburetor, a little tuning, and some electrical help turned his hair back to it's natural color. 38 Chevy Coupe. This one had a very scary front end and scarier brakes. After picking the car up, he called back and said he took his hands off the wheel at 100 MPH and that it was straight and stable. I didn't know that was going to be the ultimate test but was glad that he was happy with our work. 70 Dodge Charger. A fresh eBay purchase that was supposedly all new. The owner brought it in and said it handled like a duck???? A complete front and rear suspension rebuild along with new brakes made it what it was supposed to be. 38 Ford Deluxe that underwent a firewall forward restoration, new wiring and a complete new interior, including the metal wood graining. Oldsmobile 442 W-30 in for some tuning. 70 Boss 429 Ford mustang. One of Ford's finest. Due to it's rarity and replacement cost, it makes me nervous every time he brings it in. 30 Ford model A street rod. This one had a persistent leak in the corvette differential that would coat the back of the car with grease. Several tried and failed to correct the problem. Relocating the vent tube is all it took. 427 Cobra. 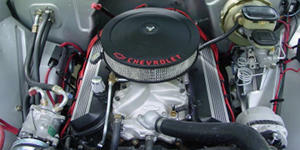 Immaculate car that developed a small cooling system issue that created quite a mess. All restored now like it never happened. '72 Landcruiser first done by another shop. It came to us with a myriad of mechanical deficiencies that were overlooked. Here it is with them all corrected and ready to go home.